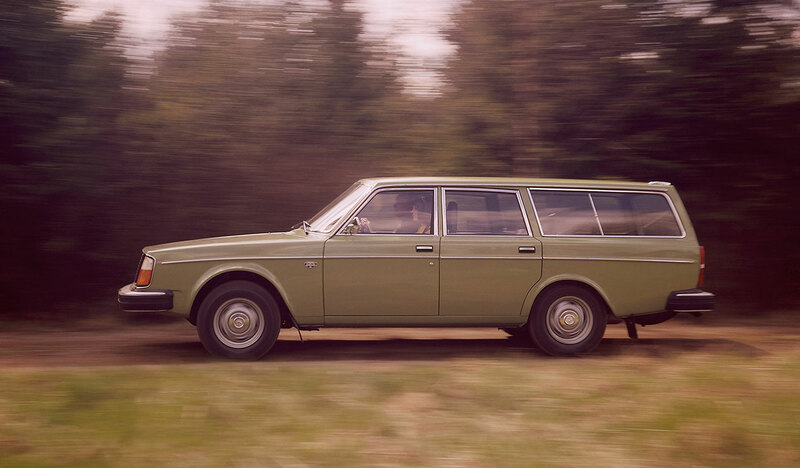 In the Autumn of 1974 the Volvo 240 and 260 Series was launched. At a glance it looked like the earlier 140/160 Series, but was also based on the Volvo Experimental Safety Car, a 1972 prototype experiment in car safety. McPherson strut type suspension was fitted to the front and the rear suspension was a modified version of that fitted to the 140 Series. The brakes were also modified. The main changes were to the engine. Although some models, the 242L, retained the B20A engine, most other versions had the new B21 4-cylinder engine. It had a cast iron block and a 5-bearing crankshaft and a belt driven overhead camshaft. The engine had a capacity of 2127cc with outputs of 97hp for the B21A carburettor version and 123hp for the B21E injection version. The 260 model had a new design engine developed jointly by Peugeot, Renault and Volvo (the PRV engine) - the V6 B27E with a capacity of 2664cc and giving 140hp. The block was an aluminium alloy fitted with wet cylinder liners. The new cars were available in six variants of the 240 and two of the 260. The 244GL was top of the range and had the fuel injection engine and leather upholstery. The 264GL had a choice of leather or plush upholstery and had electric windows. Power steering was standard on the 244GL and the 264. All models had a choice of manual or auto-matic gearboxes. The 1976 models were introduced in the Autumn of 1975 and several changes had been made. A carburettor version on the B27 with an SU carburettor giving an output of 125hp was added to the range but only used in the 264DL and the new 265DL estate. The choice of gearbox was also improved throughout the range. The B21A had a new camshaft which increased the output to 100bhp, and the B20A engine was dropped from the range because of emission regulations. The gearboxes were improved and new manual gearboxes introduced. 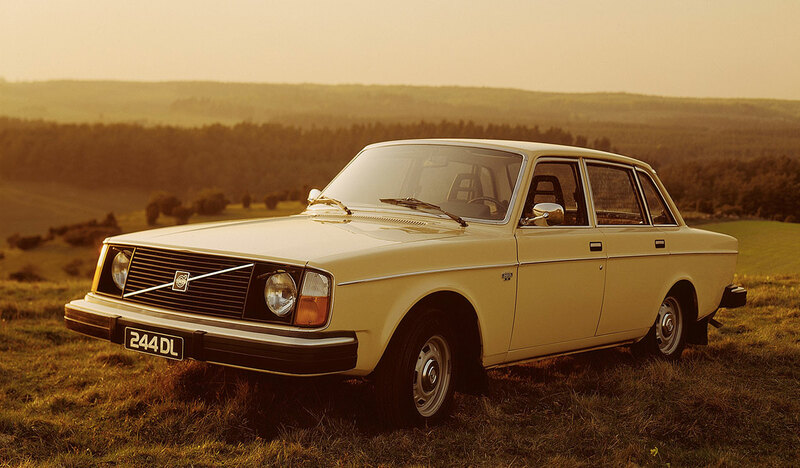 Volvo celebrated its 50th Anniversary in 1977 and released a limited edition version of the 240, the 244DL "anniversary" car. It was finished in metallic silver with black and gold decorative trim and plush upholstery. The glove box was fitted with a silver plaque with the text "Volvo 1927-1977." Special badges were also fitted to the sides of each front wing. The 264GLE was introduced with automatic gearbox, alloy wheels and air conditioning as standard. New standards of quality control were introduced as it had become clear that the anti-corrosion and paint treatments were not up to the expected standard and many 1975/76 models were suffering severe rust problems. 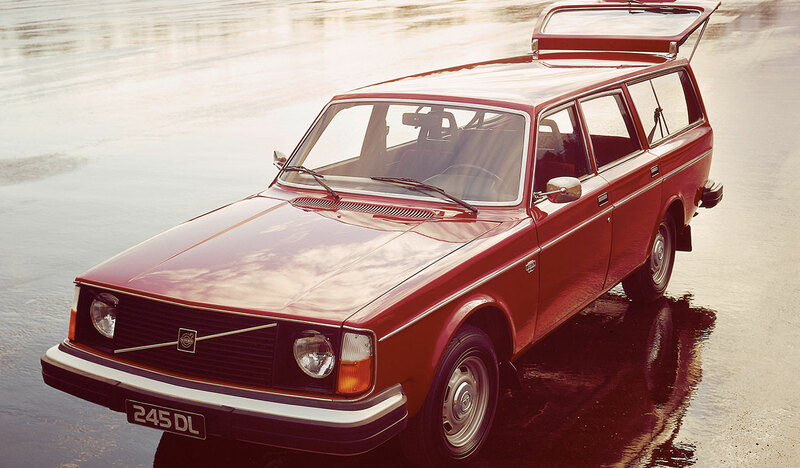 During 1977 Volvo also won British awards for car safety and in the USA the 240 was selected to develop guidelines for US safety standards. By now, the variants of the 240 were extensive, with different markets using differing specifications of engine and body trim. 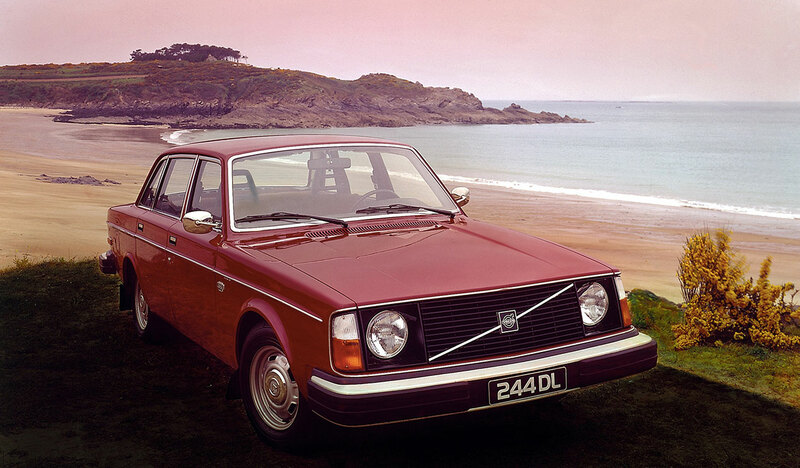 In March 1977 Volvo showed off its new model at the Geneva show, the 262. It was aimed mainly at markets with exclusive tastes. The 262 was based on the 264, in fact Volvo shipped 264 'kits' to Bertone of Turin who rebuilt them with the modifications. The seats were upholstered with black leather and doors had hardwood panels and the seats lower than 'normal' models. During 1976/77 only 3,239 two-door 260's were built; then in the Spring of 1977 it was redesigned the 262C. To begin with they were only available in metallic silver with a black vinyl roof but from 1979 modifications such as an enlarged boot lid and wrap-around rear lights, front spoiler and new design alloy wheels were introduced. An all over metallic gold finish was also available. Production halted momentarily in the summer of 1980 and then restarted in spring of 1981 with a new front design. In all only 6,622 models of the 262C were made, most going to the USA and Europe. This was a car for the truly discerning, as it also featured tinted glass, heated front seats, electric rear-view mirror, aerial and side windows, under-bonnet and boot lighting and power steering. In 1978 a few minor modifications were introduced mainly to the front of the car, and the seats were redesigned. The 242GT model was introduced, but not in the UK. This was a 'sporty' two door version with alloy wheels, power steering, fog lamps, four speed plus overdrive gearbox and firmer suspension and a rev counter. Again in 1979 some modifications were made. The GL's and GLE's had rectangular headlamps and a new grille. The front suspension was modified with stiffer shock absorbers, heavier anti-roll bars and the caster angle on models with power steering was altered. The diesel driven D24 was introduced powered by a Volvo-Volkswagen six cylinder engine with 2383cc capacity and giving an output of 82hp. This version never made much impression on the UK market but was well received in Europe and the USA. The redesigned 264GLE made it a 'luxury' car and made it popular with the wealthy and as a company car. The top of the range 240 was the 240GLE. It was fitted with the B21E engine and a choice of three speed automatic or four speed with overdrive gearboxes. Alloy wheels and a front spoiler were extras, as was power steering. 1980 saw the introduction of the 244GLT (Grand Luxe Touring) model using the four-cylinder B23E injection engine with 140hp or the V6 141hp engine in the saloon, the estate using only the V6. The V6 versions were not intended for the UK market but it is reported that around 200 were brought into the country to test the market. The car was very sporty and striking in its appearance with all black body trim, multi spoke alloy wheels with low profile tyres and leather or plush upholstery. The 244GL had a new B23A block giving 112hp and the B23E giving 136hp. The B23E was also fitted to the GLT. A new V6 engine was also released in the 264 range, the B28 giving 155hp. In Sweden the 240 Turbo was released with the B21ET engine giving 155hp. This model never reached the UK market because it could not be converted to right hand drive because of the design of the exhaust manifold. A few have been imported and conversion meant a 'one-off' manifold had to be made to avoid the steering column. The new 1981 model was also released in late 1980. The model had undergone many changes. The bumpers were smaller, lights were redesigned, and a redesigned front spoiler were some of the changes. Inside there was a new dash layout. Under the bonnet saw numerous changes also. The GL got a B23A engine with an output of 112hp. The high compression ratio of 10.3:1 gave rise to many complaints of 'pinking'. The GLE had the B21E engine and the GLT the B23E engine which now gave a lower output of 136hp. Refinements in the emission control were introduced also at this time. The overdrive, standard on most GL, GLE and GLT models with manual gearbox automatically disengaged when the gear stick was moved out of fourth gear. In 1983 the 'fleet' was trimmed and all were called '240'. Three engines were available, the 106hp B21A, the 112hp B23A and the diesel 82hp D24. The GLT retained the B23E engine. All other specifications could be included 'to order'. The only V6 variant left now was the estate, and the 240 variants now adopted the 260 front grille and bonnet. The 240 with the B23A engine was then fitted with a new five-speed gearbox. In 1984 some more modifications were made, with modification of the cylinder head of the B23E engine which gave an output of 129hp. The AW71 automatic gearbox used on the 760 was available for the 240. 1985 saw more changes to the engines as the 'low friction' engine was introduced. This was to increase engine life and improve fuel economy. Numerous modifications were made to many components of this engine. The new engine was designated the B230 with the introduction of a two litre B200 engine. This was the year that Volvo discontinued the 260 Series. In 1986, the year the number of 200 Series models exceeded two million, the car received another facelift. The front of the car was noticeably changed, with a new grille and bonnet, and redesigned rear-view mirrors. The boot lid was also redesigned and changed from the 'flat, look to a more curved appearance. An additional high level brake light was fitted to the rear screen. The three-way catalytic converter and Lambdasond engine system, used back in 1976 on models for the American market, were fitted to the UK models. This had the effect of reducing the power of the engine by about 10%. The following year saw the inclusion of a few more cosmetic items as standard, such as rear head rests on the saloons, and some more modification made to engines. Up until the end of production of the 200 Series in 1993 very few changes were made to the car. For the last couple of years only the estate version was made. So what made the 200 Series Volvo such a popular car for so long. For those who have driven it, and many of you will have at some time, the answer is very clear. It is reliable. Reliability is considered to be one of the most important features of any car. If the car was maintained properly the engine could be expected to run without trouble for over 100,000 miles. Indeed, figures in excess of 200,000 miles have been reported. A tribute to outstanding engineering. It is a pleasure to drive and very comfortable. Some refer to it as a mobile armchair, I won't argue with that, I like to travel in some comfort. The only thing I will say against it is that it doesn't like strong winds, you have to hold on to the steering a bit firmer. It is also a very safe car in the event of an accident and this has helped maintain its position as one of the safest cars on the roads. I have been asked many times what to look for when buying a second hand 200 Series Volvo. First thing to do, is NOT to switch on the engine yet. Let us start with the outside, the visual examination. Signs of damage repair or misuse will often show up by looking for variations in the colour of the paintwork. Although Volvo's have a good reputation for not rusting there are a few places that the 200 did suffer. As mentioned earlier, the very early models suffered badly because of poor anti-corrosion processes. The rear wheel arches tend to show signs of rust because moisture gets between the lips of the wing and inner wing panel. With age the sealant becomes cracked and loose. It is not too expensive to replace the wheel arches. The tailgate of the estates has long been a problem, but later models received extra attention in that area. For some reason the models of the early 80's suffered rusting at the bottom forward corners of all four doors. Rusting of the windscreen aperture seemed to effect some cars. Water leakage through the bulkhead can lead to all sorts of problems, and many suffered such leakage. The source was often bad fitting grommets or blanking plugs. Water leaked down the inside of the bulkhead and settled in gullies in the floor pan and if left undiscovered would gradually start the rusting process. Often, cars less than 10 years old would suddenly develop holes in the floor pan along the sides. The fuse box also suffered from corrosion through moisture build-up because of its poor location. Regular cleaning and some Vaseline often solves problems here. Continuing the visual examination, the car should not sag on its suspension, if it does then the springs have taken quite a load over its life. Most 200's had oil-filled shock absorbers and should be checked for leakage, but some GLE's and most GLT's had gas-filled shocks. The 200 also had quite an appetite for front tyres, especially models with power steering, which for 'town' driving I consider essential, unless you eat three Shredded Wheat a day, and once you've had the pleasure of power steering you don't want to go back to 'tug and pull'. A common problem for many years was rapid wear on the outside edge of the front nearside tyre. This was rectified by fitting a harder brush to the wishbone-to-body bracket. Fitting a stiffer front anti-roll bar will also help. Having satisfied yourself with the outside of the car a good look inside is next. Make sure all the bits of trim and panels are properly mounted and not held on with tape or other means. Make sure all the switches work. Look at the mileage, don't panic if it is high, often a high mileage car is better because it has been used. Make sure all the digits are in a straight line. If one is crooked then the clock may have been altered. Look at the condition of the upholstery as this gives some idea of how much use it has had. In the boot look at the wells each side and look for rust. On older cars expect to see some, but make sure it has not started munching big holes. Under the bonnet look for oil leaks, and if the car has been serviced by Volvo this will be easy because they often steam clean the engine. However there are not many Volvos around that are dirty under the bonnet. Check the oil dipstick, making sure it is between the two marks, and look at the colour of it. If it is grey or has bits of white "cream" then the oil may be contaminated with water. This may be because it has done a lot of short journeys. When satisfied that all looks well then start up the engine. If the engine is cold and not run for some hours a gentle tap may be heard, especially on high mileage engines. This is normal and goes when the engine warms up. If it has a manual choke make sure it is working. Injection engines and later carburettor engines had an automatic choke system. The rev counter should register around 1200rpm. Press the accelerator a few times and the engine should respond positively. A test drive comes next, and the car should drive away smoothly without jerking. The gear changes of both auto and manual boxes should be smooth, otherwise a problem with that unit may be the cause. There should be no or little transmission noise, the 200 is very quiet even with 150,000 miles on the clock. A short drive should indicate if there are any problems with engine, transmission, steering or brakes. Some repairs can be expensive so it helps if you can get the assistance of someone who knows what to look for, such as an RAC vehicle inspector. I am sure the Volvo 200 will be seen on the roads for many years to come and one day I expect to see it listed as one of the great classic cars of the great era of motoring. 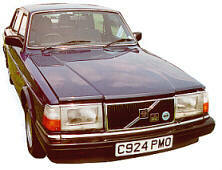 Volvo 240 production, engine and gearbox information. Volvo 260 / 264 production, engine and gearbox information. NOTE: The 262 and the 262C are different cars. The 262 was based on the 264 and made mainly for the US market and designed and made in Sweden. The 262C was designed by Bertone.